Sarah grew up semi-nomadically all over the East coast. When she was around seven she took part in a section of the “peace wave,” an offshoot of the “Great Peace March,” which aimed to walk across the US. Apparently the beginning of her love of travelling long distances, when she heard about the Mongol Rally in 2005, she decided she had to do it. Every year since then she and Anand have tried to enter, only to be denied each time. This year, as Sarah arrived in Uzbekistan to do fieldwork for her dissertation, she received an email from Anand saying they’d won a slot. 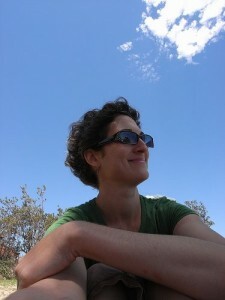 Currently Sarah is a grad student in Santa Monica studying water management in Central Asia. She spends her “free time” fixing up a motorcycle, playing music, and making things (furniture, art, etc). Mongol Rally job: Obstacle Avoidance Specialist and bazaar negotiator. Where you will pretend to be from when you get tired of answering questions about America: Old Mexico. Hey, it’s worked before! Instruments attempted to have learned: In chronological order: Violin, recorder, guitar, piano, kemence, ukulele. If you were a car part, what would you be? The idiot light; I’m paranoid about running out of gas.